In his new book Whisper, Mark Batterson says he has seen how hearing “the still, small voice of God” can transform lives — and impact an entire city. 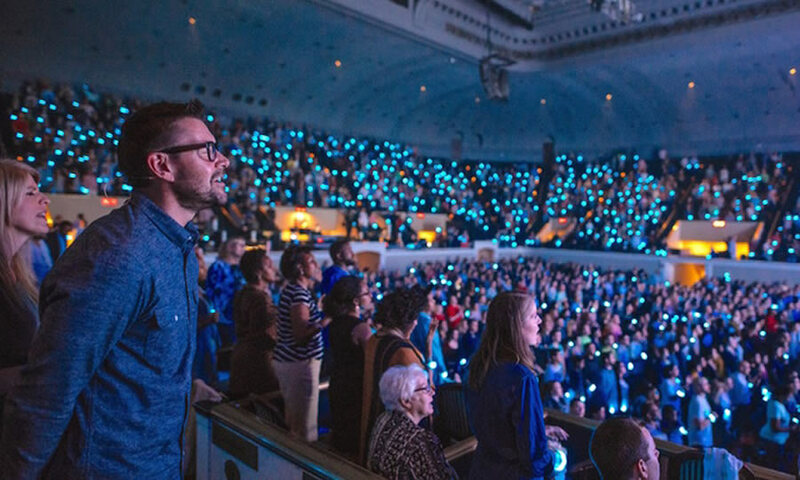 Pastor Mark Batterson joins in worship with the National Community Church family, where more than 3,500 people in the D.C. metro area attend weekly services. Mark Batterson has many titles, but perhaps the most apt is truth-seeker. For over two decades, “Pastor Mark” as he’s known has led National Community Church (NCC) in one of the nation’s most religiously diverse cities — Washington, D.C.
“Or our reality can conform to our theology. I think the latter is the process of spiritual growth,” states Batterson. More than discussing abstracts, he leans on stories and word-pictures in his messages — including his new book Whisper: How to Hear the Voice of God. It picks up where he left off in The Circle Maker, a best-seller on prayer read by over two million people. Batterson believes listening to God and applying what is said are what makes the NCC family an uplifting presence in the metro area. In recent years, it has become the largest church based in the nation’s capital city. More than 3,500 people worship weekly at 13 services across eight NCC locations. In an interview from his downtown D.C. office, he shares his experiences as pastor and truth-seeker. The Stream: Whisper highlights a trend you call “copycat spirituality.” What is it and why is it concerning? Mark Batterson: Copycat spirituality is about mimicking the people around you. It’s almost spiritual codependency. It’s relating to God through the medium of another person, instead of really learning to listen to God’s voice. You get a word from God by spending time in prayer. Not just talking to God, but listening to God. I’d like to think that when I preach, people get something out of the message and it helps them grow spiritually. But I also know that people don’t need another sermon as much as they need a word from God. You get a word from God by spending time in prayer. To me, that’s a two-sided coin: not just talking to God, but listening to God. A few years ago, I wrote a book about talking to God called The Circle Maker. Really, Whisper shows the other side, listening to God, which is when prayer becomes a dialogue. God wants to have a conversation with each of us. Copycat spirituality is honestly a form of legalism, and you can see it in the Pharisees. God wants us to have a more genuine relationship. His sheep hear His voice, we read in John chapter 10, and I believe that’s the key to authentic spirituality. The Stream: Could you share about the seven languages by which God speaks? Mark Batterson: The first language is Scripture. It’s in a category by itself. In fact, all the other languages I call secondary languages because they have to filter through Scripture. Scripture is the Rosetta Stone, if you will. The other six are desires, dreams, doors, people, promptings and pain. Those are all ways that God speaks in Scripture. He is not any less able to communicate to us now than He was then. He communicates in the same ways, so there’s actually a biblical basis for all of these languages. I don’t pretend that this list is exhaustive. For instance, God certainly speaks through the natural world He created. Psalm 19 says, The Heavens declare the glory of God. So these seven languages are just a good starting point for learning to hear the voice of God. The Stream: Some of these ways that God speaks may sound strange or ethereal to people. How can believers know it is not ourselves talking? Mark Batterson: There is no shortcut to learning a language. I took Spanish in high school, and it took all of three and a half years for me to get semi-fluent in that language. These languages are no different. It takes time to acquire. Part of it is relationship. My wife and I have been married 25 years. I have learned to discern her voice. I know the tone of voice, the non-verbal communication — because I have relationship with her. Over time, you learn to discern His voice. The language of desire, for example; there are sinful and selfish desires. You’ve got to be mature enough to know, That’s not the voice of God. The Bible also says in Psalm 37:4 that if we delight ourselves in the Lord, He’ll give us the desires of our hearts. We’ve got to discern those desires God has conceived within us. That takes time and patience. Part of why I wrote the book is because it’s not easy. My hope is this will help decode some of these languages in a way that we get better at discerning His voice. The Stream: You’ve long been connected to the global prayer movement, which has become more visible in D.C. in recent years. As prayer across the political aisle has increased, do you see it impacting Capitol Hill? Mark Batterson: I do. After writing The Circle Maker, I had a number of Members of Congress who reached out to me. Each said a variation of: I just want you to know I am circling the Capitol in prayer. We don’t hear about that on the nightly news, but it’s awfully encouraging. We are praying for revival in our nation’s capital. Maybe that’s a bold prayer — so be it. For most people who live outside the Beltway, there’s a lot of skepticism and cynicism. Much of it is warranted. But at the end of the day, I am seeing God’s Kingdom come in a unique way here in D.C. It starts and ends with prayer. In between, we are seeing so many people come to faith in Christ. I for one am encouraged. We are praying for revival in our nation’s capital. Maybe that’s a bold prayer — so be it. That’s what we’re believing for. The Stream: You’ve often said that certain issues many think of as political are actually biblical. Could you give a specific example? Mark Batterson: This past year, the topic of immigration and refugees has been at the forefront. I don’t believe it’s my job to figure out all of the political nuances or policies of how to govern that issue. But here’s what I do believe. It is my obligation as a Christ-follower to love the refugee. I see that in the Old and New Testaments. In truth, Mary and Joseph and Jesus were refugees from Bethlehem who escaped to Egypt for a season. So I love the fact that we here at National Community Church have 250 people on a refugee care team. When people resettle in this area, we’re helping them find a place to live, find friends and acquire language. Ultimately, we hope we can help them discover a relationship with Christ. In many ways, immigration has become a hot-button political issue. I believe it’s a biblical issue. We’ve got to show hospitality to the foreigner, so to speak. The issue is not easy to navigate politically, but so important for us to put into practice biblically. Whisper by Mark Batterson releases October 24 via Amazon, ChristianBook.com and wherever books are sold. In part two of this interview coming soon, Pastor Mark tells his recent story of supernatural healing, how the D.C. Dream Center is touching lives in the nation’s capital and more.